The Air Force is looking for 3,340 airmen to leave early or retire by October so the service can meet its congressionally mandated end strength. You can see a complete chart in this week’s Air Force Times that shows which airmen can apply for waivers for their enlisted contracts, active-duty commitments and time-in-grade requirements. The deadline to apply is Aug. 1. 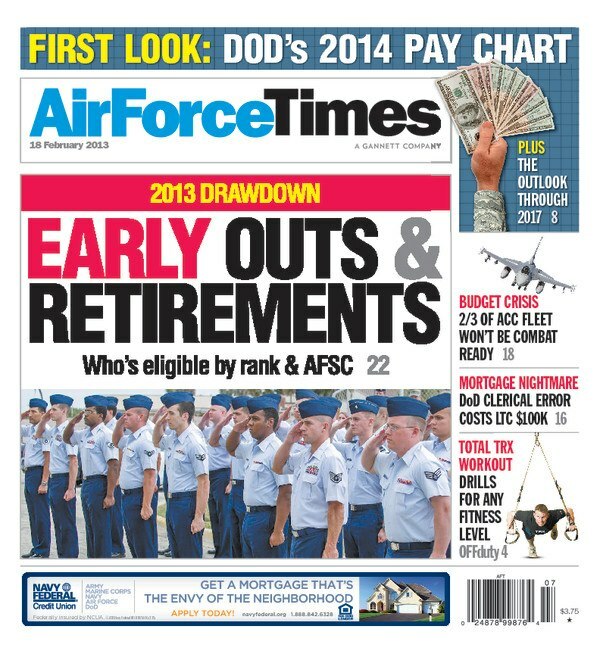 Also in this week’s edition: The Air Force is getting tough on airmen who do not meet the requirements for their tuition assistance benefits. Read what you need to know to avoid losing your benefits. In other news, authorities have charged the driver of a pickup truck who allegedly sped across Joint Base Elmendorf-Richardson, Alaska, struck an occupied security forces vehicle and then crashed a base gate. Kyle S. Hansen is charged with assault on a federal officer and related offenses. Security forces shot at his truck during the incident, hitting it several times. And after 11 years and 1,800 evacuated wounded, the last rescue squadrons at Kandahar Airfield are moving out. You can read about what the squadrons accomplished during their time in Afghanistan.